When Lawrence Livermore National Laboratory researchers invented the field of biological accelerator mass spectrometry (AMS) in the late 1980s, the process of preparing the samples was time-consuming and cumbersome. Physicists and biomedical researchers used torches, vacuum lines, special chemistries and high degrees of skill to convert biological samples into graphite targets that could then be run through the AMS system. At that time, it took two days of work to prepare only eight samples. As Livermore became a world leader in biological AMS work and was designated in 1999 as the National Institutes of Health’s (NIH) first National Resource for Biomedical Accelerator Mass Spectrometry, the technology underwent a series of upgrades. However, during this past summer, Livermore scientists have made much more dramatic advances to the sample preparations and AMS operations that have been sought for years by the biomedical research and pharmaceutical communities. Now, with the aid of a new sample-preparation method that accommodates liquid samples and bypasses the graphitization process, the Livermore scientists can prepare and analyze samples in minutes — instead of days. The Livermore scientists also have developed a new and much-simplified biological AMS system that can be operated in almost routine laboratory use by biomedical researchers without the expertise of accelerator physicists. Biological AMS is a technique in which carbon-14 is used as a tag to study, with extreme precision and sensitivity, complex biological processes, such as cancer, molecular damage, drug and toxin behavior, nutrition and other areas. The $3 million bio AMS system, funded by a 2011 NIH grant and located in LLNL’s biomedical building, came online in July after it was delivered and assembled in less than a month. It is expected sometime in 2016 that 90 percent of the samples run in the bio AMS instrument will be liquid samples and more than 100 samples per day could be run, said Graham Bench, the director of the Center for Accelerator Mass Spectrometry (CAMS). “I’ve always thought that one of the biggest impediments to the widespread use of the bio AMS is that the system is complex and requires expert staff,” Bench said. “The recent work we’ve done enables it to be run by biomedical scientists without the aid of accelerator physicists. Bench credited the NIH for its support of the biological AMS technology development and the accompanying biomedical research that has been undertaken. “We’re very excited about the possibilities and potential of individualized cancer therapy,” Bench said, adding he believes it could be a huge growth area in the 21st century. Ken Turteltaub, the leader of the Lab’s Biosciences and Biotechnology Division (BBTD) and one of the original developers of the bio AMS process, notes that the primary goal of the center during the past five years has been to make the technology more accessible to biomedical and pharmaceutical researchers. “These achievements are a big deal because they allow us to support real clinical studies. We have put a huge amount of focused effort into improving the machine’s throughput, simplifying sample preparations and trying to automate the instrument. We succeeded through the development of a gas ion source and the development of our moving wire interface,” Turteltaub said. In August, the NIH awarded a five-year, $7.8 million grant to BBTD and CAMS for its biomedical research as the National Resource for Biomedical Accelerator Mass Spectrometry. The grant marked the fourth five-year grant award over the past 15 years (the three others were in 1999, 2004 and 2009). With the grant and new bio AMS system, Livermore researchers and other scientists will continue to perform human subject tracer studies and body burden assessments addressing important questions in nutrition, toxicology, pharmacology, cancer research, drug development and comparative medicine. LLNL’s National Resource for Biomedical AMS currently works with more than 60 medical centers, universities and other entities around the world on various studies. LLNL researchers will be working to develop and validate the new bio AMS instrument with the goal of deploying the technology to general clinical laboratories in about five years. To date, the Lab’s bio AMS technology has been the basis for the formation of four companies that mainly assist the pharmaceutical industry – Accelerated Medical Diagnostics and Vitalea Science, both located in Davis, California; Seattle-based Accium Biosciences and United Kingdom-based Xceleron. In addition, one pharmaceutical firm, Glaxo Smith Kline, has set up its own bio AMS system for in-house use in the United Kingdom, and LLNL researchers have trained the firm’s scientists on the system, Turteltaub said. In the bio AMS process, a substance to be studied is tagged with carbon-14 or another radioactive isotope and ingested or absorbed by a test subject. In the hours, days, or weeks that follow, the carbon-14 isotope will show up in the subject’s DNA, blood, urine or tissue. It reveals how animals and humans metabolize carcinogens, vitamins, toxins, potential new therapeutics and any other biological substances that can be tagged with carbon-14. To study how humans respond to an existing or candidate medication, Livermore researchers and medical collaborators developed a technique called microdosing, in which a patient takes just 1/100th of a normal therapeutic dose. The drug’s behavior in the patient’s body can easily be measured and studied, and the low dose has no effect on humans or animals. 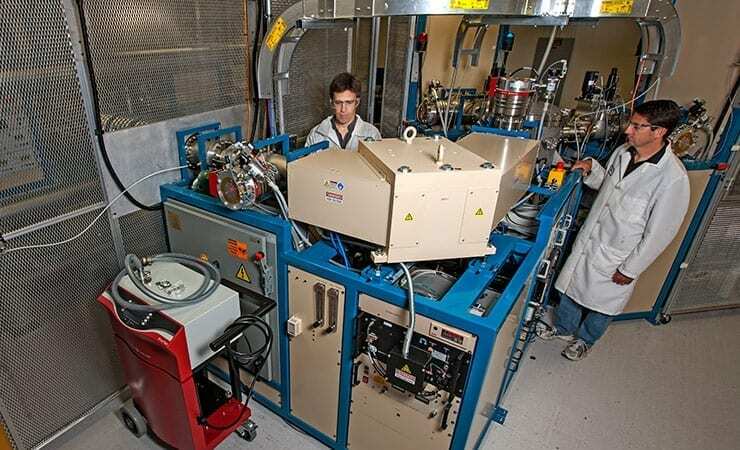 AMS uses an accelerator to count the carbon-14 atoms in a sample. It is sensitive enough find one carbon-14 isotope among a quadrillion other carbon atoms. Unlike the two AMS machines – one a large 10 million volt system and the other a smaller 1 million volt system – in CAMS, the new bio AMS system will not use a tandem accelerator to count its isotopes. Instead, it will use a high voltage deck with an air-insulated acceleration column that accelerates ions to high velocity in order to eliminate interfering ions, said Ted Ognibene, a chemist who has worked on the AMS for 15 years. Ognibene and former LLNL Lawrence fellow Avi Thomas developed the technique to produce liquid samples by converting the carbon content of the samples to carbon dioxide and transporting the gas to an ion source, where it is ionized before it enters the acceleration column. Not only can the technique generate results in minutes, it permits the sample size to be reduced by 50,000-fold — from 500 micrograms (500 millionths) to 10 nanograms (10 billionths) of a gram, Ognibene said.